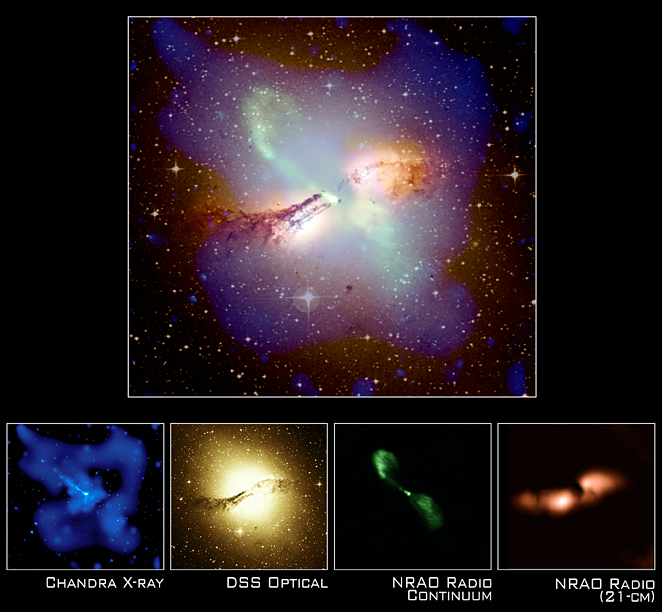 A composite X-ray (blue), radio (pink and green), and optical (orange and yellow) image of the galaxy Centaurus A presents a stunning tableau of a galaxy in turmoil. A broad band of dust and cold gas is bisected at an angle by opposing jets of high-energy particles blasting away from the supermassive black hole in the nucleus. 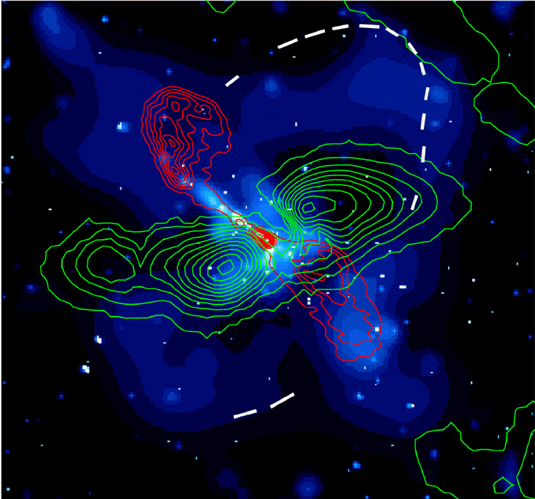 Two large arcs of X-ray emitting hot gas were discovered in the outskirts of the galaxy on a plane perpendicular to the jets. The arcs of multimillion degree gas appear to be part of a projected ring 25,000 light years in diameter. The size and location of the ring indicate that it may have been produced in a titanic explosion that occurred about ten million years ago. Such an explosion would have produced the high-energy jets, and a galaxy-sized shock wave moving outward at speeds of a million miles per hour. The age of 10 million years for the outburst is consistent with optical and infrared observations that indicate that the rate of star formation in the galaxy increased dramatically at about that time. Scientists have suggested that all this activity may have begun with the merger of a small spiral galaxy and Centaurus A about 100 million years ago. Such a merger could eventually trigger both the burst of star formation and the violent activity in the nucleus of the galaxy. The tremendous energy released when a galaxy becomes "active" can have a profound influence on the subsequent evolution of the galaxy and its neighbors. The mass of the central black hole can increase, the gas reservoir for the next generation of stars can be expelled, and the space between the galaxies can be enriched with heavier elements.